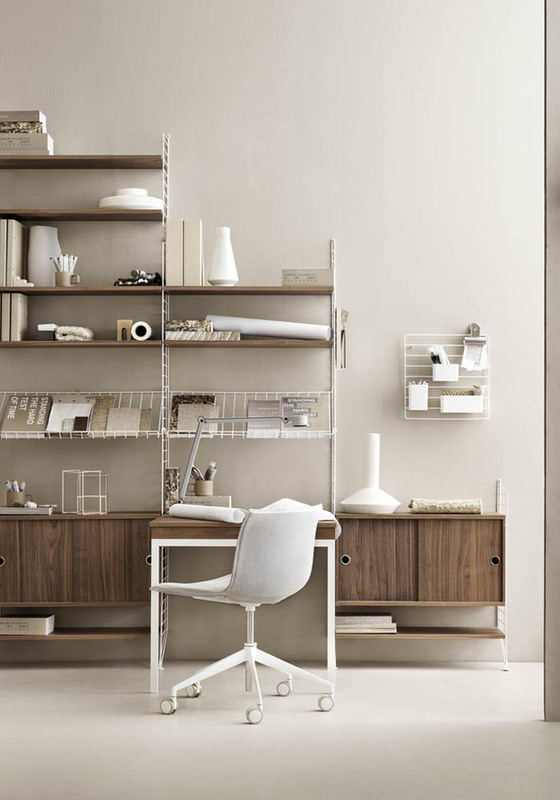 Designed in 1949 by Swedish Architect Nils Strinning, the String® shelving series is now considered a design classic thanks to its versatility and understated aesthetic. Still manufactured in Sweden, the String® modular shelving system consists of various basic elements (shelves, desks, doors), which can be assembled together to create a scalable shelving system that fits right in with your living requirements. This is great, isn’t it!? Finding the perfect storage solution is key to keep clutter at bay in your home. Think ahead & aim to foresee your family needs in 5 or 10 years. The idea of a modular shelving system like the String® Furniture is that you can start small with a small shelving unit such as the String® pocket shelves. This is a great unit for a small kitchen or bathroom. The best way to forecast your family’s requirements is to write down what potential storage you will need for each room. Choose carefully the colour and finish you think you can live with years to come. While the green or pink String® pocket shelves look great in a kids bedroom, will you still love them enough once the children have grown or left home? If pink is not a colour you foresee in your home in the future, choose more timeless colours such as white shelving or shelves with an oak finish. Choose also a system that you can move from the children’s bedroom into the lounge, your bedroom or home office like these shelving units with a work desk. Think about what you want to store. Books, CDs, shoes, magazines, kitchen accessories, the list of things to store in our home is endless. Some String® shelving modules come with drawers and cabinets like these. In which room are you planning to use them now and in the future? Whether it is for your bathroom, bedroom or kitchen, the size and finish you’ll require may greatly vary. In the lounge, the String® shelving system is great to put your most beautiful books on display. In the bedroom, the String® shelving units can be linked together or be separated. One system with many solutions. Achieve visual balance by hanging a String® shelf the width of your bathtub in the bathroom…How gorgeous is this bathtub!?? Use the String® Furniture as a bedside table to display your favourite things at bedtime. So I’m sure by now, you have understood that the String shelf is really functional. The starting price is low and you can add shelves and other components as budget allows. If you’re interested in this modular shelving system, you can order it HERE. You can follow me on Bloglovin’ here or sign up to my E-news here. Photography: Marcus Lawett, styling: Lotta Agaton | This blog post contains affiliates links. Thank you very much Luna. I really appreciate your feedback :-) I love the styling of Lotta Agaton..are you familiar with it? Amazing design! I am still amazed by the photographs! Great images! I agree that shelving can solve the problem with finding storage for all the small things. Thank you for the ideas! Thanks for highlighting STRING and our range incl. news/photos! As you saw we just released a bunch of new stuff including a very sophisticated beige and an outdoor version in galvanuzed steel (don’t rust). I saw you wrote that you like Lotta Agaton’s work – so do we. We put a lot of work into our photos/ pictures and the way we present our stands at fairs. If you visit Stockholm Furniture Fair (feb) or Salone (april) please come by and visi5 our stand. Thanks a lot for highlighting STRING and our products! I saw that you like Lotta Agatons work – so do we! Please stop by our stand in Stockholm (feb) or Milan (april) if you are visiting any of those fairs.